Would Ayew be a Good Fit at West Ham? 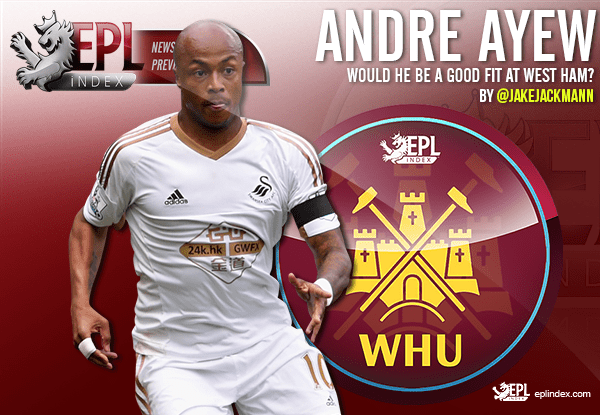 EPL Index > EPL Index Featured Article > Would Ayew be a Good Fit at West Ham? On Sunday, news broke that West Ham have made a £20m bid for Andre Ayew as they continue to search for attacking reinforcements. This came hours after it was announced that the club had agreed a fee for Diafra Sakho with West Brom. Transfer business is hotting up at the club as they attempt to build a squad strong enough to compete in the top seven of the Premier League and deep enough to deal with the added games of the Europa League. Andre Ayew has been linked away from Swansea in the last two windows and it wouldn’t be surprising if they agree to sell the Ghanaian. Sky Sports understand that Swansea have yet to decide whether to accept the offer, but will not sell Ayew until they have brought in attacking targets of their own. West Ham have been chasing strikers since the season ended. They had been linked heavily with Alexandre Lacazette, Michy Batshuayi and Carlos Bacca, all very highly rated forwards. It will be an anti-climax if they bring in Ayew, not only as he doesn’t have as big a profile, but he isn’t a natural number nine. He has played the majority of his career as a left winger and would be an underwhelming choice to lead the line for West Ham this season. West Ham had been interested in Ayew last summer when he was available on a free. The former Marseille star asked for high wages and several sides were put off including West Ham, as it wasn’t certain that he would do well in the Premier League. However, he thrived at Swansea and finished the season as the club’s top scorer with 12 goals. It was when he was used centrally that he was most dangerous, scoring six in nine starts. This record when playing as a striker may be a big part of the reason why West Ham have submitted a £20m bid. His versatility make him a great option for West Ham, as he would could fill in on either wing or in central midfield. He would be used as a striker the majority of the time, but with the added matches that the Europa League will bring, it is good to have a player like Ayew in the squad. At Swansea, he showed a willingness to put the team ahead of himself and fill in where required. This shows how he has matured over the years as he was once seen as a player with a bad attitude. At the age of 26, Ayew is developing into a fine player and will continue to improve as he gets used to the league. West Ham already have Andy Carroll in their squad and Ayew would complement him well. The Ghanaian international is quick, strong and moves well in the final third. His mobility and skill on the ball make him a threat when he is running at defences. Meanwhile he is physical enough to hold the ball up and hold the ball up for midfield runners. His finishing has improved a lot over the last 12 months and he is also oddly good in the air for a man of his size. Since the window began, West Ham have been looking for a quick, mobile forward and although Ayew isn’t their first choice, he would be a good addition to the squad. It gives them another option outside of Andy Carroll, which is required given his injury problems. Slaven Bilic could choose to play two strikers and the combination of Carroll with Ayew would work well. He also has Premier League experience and knows Dimitri Payet well from their time in France together. That will be a positive both on and off the pitch. I can understand why Ayew is low down on their list of targets. However, I think he would improve the squad, both in terms of striking options and cover for other areas. Categories: EPL Index Featured Article, EPL Team Analysis, Swansea City, Swansea City (NN), West Ham United, and West Ham United (NN).' 'Tags: Andre Ayew, Ayew, bilic, english Premier league, English Premier League Opta Stats, EPL Stats, Opta Stats, premier league, premier league opta stats, and West Ham. André Ayew: Why did the ‘Big Boys’ not Swoop? Do West Ham Need to Sign a Right-Back?